Blockmasons and concrete workers use specially formed concrete blocks to create structural walls, retaining walls and concrete-block columns. Using the right block for the job increases the stability, strength and longevity of the structure. Become familiar with the different types of concrete block and their applications and choose the right kind for your job. This structure is made of standard, core-fill block. The standard, core-fill block, also called a "stretcher" block or "cinder" block, is the most common type of block used to make partition, retaining and structural walls. The standard block is a rectangle measuring 8 inches by 8 inches by 16 inches. Viewed from above, the rectangle reveals a set of two portioned cells. After stacking and mortaring layers of standard block, a mason fills the hollow cells with concrete. The square-shaped concrete column block is specially designed to form the exterior casing of a cast concrete column. Like the standard core-fill block, the column block's interior is hollow. Column blocks typically measure 12 inches square and 8 inches tall. Although standard blocks may be used to construct block columns, the large interior cell of the column block generally accommodates more reinforcing steel and results in stronger load-bearing capacity. To build with column block, a mason stacks and mortars the block, inserts reinforcement bars into the block's cell and pours concrete into the hollow. Slump block is a decorative variation of the standard core-fill concrete block. The concrete mixture used to create slump blocks intentionally sags during curing. 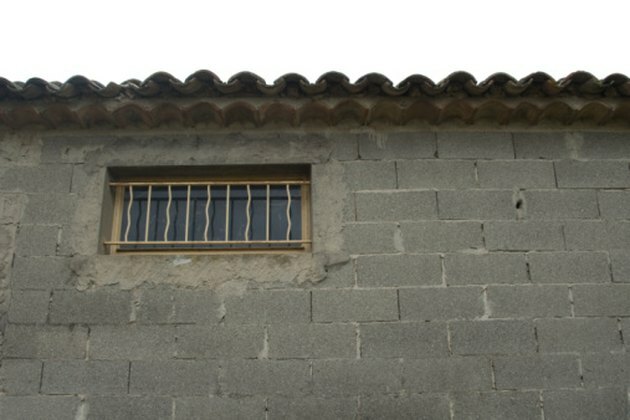 Contoured lumps cover the exterior surface of slump block; the appearance of this block resembles the look of old adobe buildings. Slump block, like standard core-fill block, has two interior cells. A mason stacks, mortars and fills the block as usual. Slump block is usually available in grey and tan. Stacked retaining-wall block does not require mortar. Although many types of block are used to construct retaining walls, the term "retaining-wall block" generally refers to a specific type of solid, interlocking concrete blocks. Retaining-wall block is easy to install and requires no mortaring or core-filling. Viewed from above, retaining-wall block has a roughly trapezoidal shape; a short flat back faces the retained dirt and two angled sides connect to a rough front. A lip on the top of the block helps the builder to align blocks during stacking. 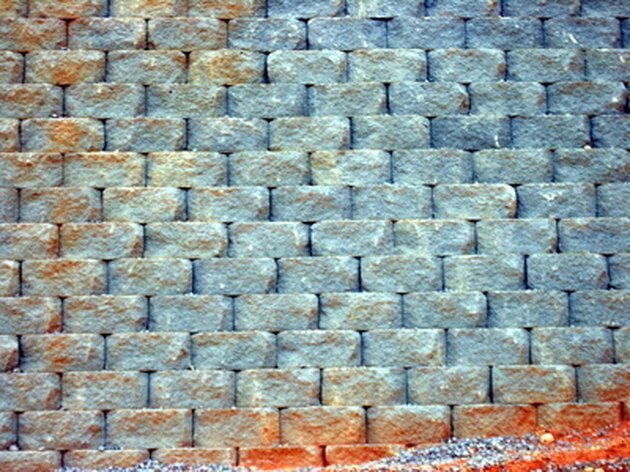 Retaining-wall block is available in a variety of colors and sizes.